Remove sticker/label. Remove any adhesive that may be left by the sticker with baby or vegetable oil. Wash in hot water with soap or a mild detergent; rinse in clear water and dry. Do not wash in a dishwasher. 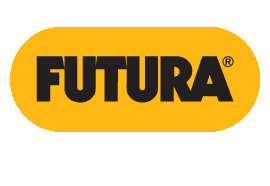 Futura Hard Anodised Cookware can be used on domestic gas, electric, kerosene or halogen stoves. Do not use pan on a coal fire or any source that cannot be regulated. Ensure that the stove surface in contact with the pan is free of grease and dirt. Futura Hard Anodised Cookware conduct heat evenly and efficiently so high heat is rarely necessary. When preheating pan on high heat, do not lose track of time so that it becomes too hot. To achieve good results, regulate the heat used with the pan. Time and heat settings in our Recipes refer to the large burner of an efficient domestic gas stove. You may have to adjust these times and settings to suit your stove. For best cooking results, adjust the heat so that cooking times are the same as those given in our recipes. You will be helped in making these adjustments by the steps and indications given in our various recipes. All frying requires the correct oil temperature for good results. Excessive heat may cause sticking and burning of food and wastes fuel. Insufficient heat may also cause sticking. While cooking in the Hard Anodised pans heat pan for some time before adding oil; add oil and heat briefly; add food. When cooking in batches, for subsequent batches, food can be added immediately after adding oil. before heating pan, rub � tsp/1.3 ml vegetable oil using a clean cotton cloth or paper napkin on the inside base of pan. Heat pan on medium-high heat till oil just begins to smoke. Reduce heat to medium. This is the point to pour batter into pan. Heating pan to the correct temperature is critical: if pan is heated beyond the point when oil just begins to smoke, pan will be too hot and batter will be difficult to spread; if pan is not hot enough (before oil just begins to smoke) batter will spread but dosa will stick. For cooking subsequent dosa do not add oil in pan before pouring batter. All foods should be at room temperature before beginning to cook. Eggs require controlled heat or they may become tough. Except for omelettes, eggs should be cooked on low to medium heat. Do not cut or chop on pan with a knife or other sharp instrument such as the edge of a metal spatula. Do not drop pan or bang it with hard or sharp objects. Plastic handles and knobs and glass lids can break under a sharp or forceful blow � handle with care. Do not bang pan on pan supports. Do not drag pan across the pan supports � lift it. Do not put pan with plastic handle or lid with plastic knob in a hot oven or under a broiler as it may get damaged. Remove sticker/label. Remove any adhesive with baby or vegetable oil. Before using pan for the first time, wash in hot water with a mild soap or detergent, rinse in clear water and dry. Do not wash in a dishwasher. Before putting your pan on the heat, assemble and prepare all ingredients and keep spatula, utensils, serving plate etc. ready in the cooking area. If you are looking for things once the pan is on the heat, it can overheat quickly and destroy the nonstick coating. It is not necessary to season the pan. If, however, you plan to cook food which tends to stick such as fried eggs without any oil or butter for the first use or before you have cooked with oil on the pan, seasoning will assist release of the food. To season: rub 1 tsp/5 ml vegetable oil over the clean nonstick surface using a paper napkin or clean cotton cloth. Wipe off oil with a paper napkin or clean cotton cloth. Wash and dry pan. High temperatures will shorten the life of the nonstick and may destroy it. Use pan only on domestic gas, electric or halogen stoves in which the temperature can be regulated to low and medium heat. Use a burner to suit the size of your pan � gas flames should not spread beyond the pan. Do not use high heat. Use low to medium heat. Some foods/recipes require preheating of the pan. Foods such as dosa, French toast, paratha, phulka and uttapam require the pan to be at a certain temperature before you cook the first batch. When preheating a cold empty pan (with or without oil) before beginning to cook, it is critical that THE HEAT IS NO MORE THAN MEDIUM and the time is strictly limited to no more than that stated for your pan in the Instruction Manual that was supplied with your pan. The actual time required for preheating for best cooking results may be less, depending on the food being cooked and your burner. Overheating can occur quickly if pan is left on the heat without food so NEVER keep pan empty on the heat once it is hot. The nonstick coating of the pan retards browning somewhat in certain foods. For browner results, try cooking slightly longer. Do not use high heat. Avoid high temperature for best cooking results, conserving fuel and preserving the life of the nonstick coating. If food is smoking or burning, reduce heat. Using medium or lower heat and limiting the time the empty pan is heating are the basic techniques to avoid overheating. The pan can overheat even on medium heat if the burner is providing excessive heat. To check if your burner can overheat even on medium heat please read and follow instructions under �How to Use� in the Instruction Manual that was supplied with your pan. Use wooden, heat-resistant nylon, plastic or rubber spatula/utensils. Metal utensils will scratch and reduce the life of the nonstick coating. Do not cut or scrape with metal objects or knives. If using a metal spatula, try to keep spatula parallel to pan to avoid digging into the coating. Try to touch the food and minimize contact with the coating. Do not leave plastic, nylon or rubber utensils on pan while it is hot. Do not hit pan or bang its rim. Do not bang pan down on pan supports. Lift pan from the pan supports � do not drag it across the pan supports. When storing pan ensure that the nonstick coating is not gouged or rubbed against any hard or sharp surface. Do not stack other utensils on the coating without protecting it. Plastic handles are liable to break under a sharp or forceful blow. After use, faint scratches or marks may appear on the nonstick coating. These are marks of normal wear and tear and do not affect the performance of the coating. Even if some of the coating is scraped off, the pan is still safe to use. The coating is non-toxic and inert; if accidentally and unknowingly ingested, it passes through the body harmlessly.